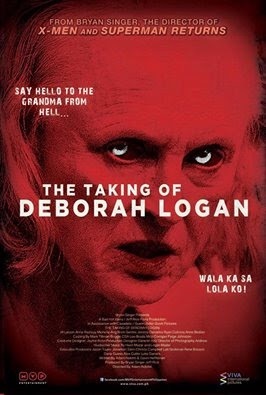 Don’t be misled by the lousy “tagalized” poster of “The Taking of Deborah Logan” because it is in for a good fright with its footage horror film element. It is “The Exorcism of Emily Rose” meets “Blair Witch Project” that deals with common fears — an old lady, black snakes, and a murderous neighbor. The plot—spiritual parasites exploiting their vulnerable host; as an offshoot of an unfinished ritual of immortality— is not as exciting as the execution, Jill Larson (Deborah Logan) delivers her best. The movie gets interesting as it progresses. It develops in you while shedding off some logic from you and startling you off your seats, in so many unpredictable scenes.